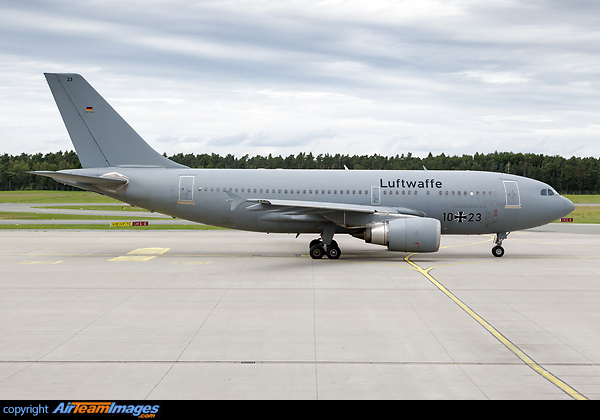 The Airbus A310 is a twin engine, wide body medium/long range airliner, Derived from the A300, with shortened fuselage and new wings and flightdeck, Many have been converted to freighters or military tankers. Production ceased in 2007. The -300 is the longer range development of the basic series 200, with extra fuel tankage in the tailplane. The -300 has winglets and is cleared for transoceanic flights to ETOPS standards . 2 x CFM CFM56 (18500 - 34000 lbf), General Electric CF6 (41500 - 69800 lbf), Pratt & Whitney JT9D (45800 - 56000 lbf) or Pratt & Whitney PW4000 (52000 - 99040 lbf) turbofan engines. Typical choices would be the CFM56-80C2A8 at 59000lb thrust, or the PW4156 at 56000lb.